Richland Library staff preparing to use the new empathy lab. Virtual reality and simulation tools are helping people in the Midlands "exercise their empathy muscle." Richland Library has a mobile empthy lab that travels to its various branches, giving customers the chance to "try on" someone else's life and see things from a new perspective. In November, the My Life Experience Empathy Lab immersed customers into the life of someone who lost their job, was evicted and eventually became homeless. This particular simulation was developed Standford University's Virtual Human Interaction Lab. Customers interact with the surrounding environment to save their home and belongings. The lab reveals the adversity of living with diminishing resources. 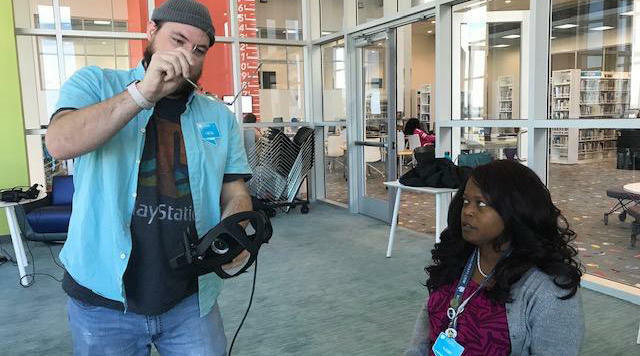 Richland Library offers virtual reality experience to help connect communities. The becoming homeless experience is just one of a few the empathy lab offers. Tamara King is Community Relations Director at Richland Library, she said she would like to have many experiences for libraries to offer to their customers. "When other libraries, who have the equipment see how easy it is to just download something or buy one or two extra things and create these experiences for themselves; we're hoping that other libraries will do this." King said she has already been contacted by other libraries for advice on what experiences they've tried. The My Life Experience Empathy Lab was made possible through a Connected Communitites grant from the Central Carolina Community Foundation and a grant for the Tides Foundation. Learn more at www.richlandlibrary.com.